Applying any material to an existing concrete surface intrinsically entails the development of a bond. Considering the ever increasing importance of concrete repair and protection, which imply the creation of an interface between two materials, an improved knowledge of concrete surface characteristics is paramount. Surface engineering, which has evolved from the world of metallurgy, addresses all surface-related considerations, notably adhesion. It provides a fundamental understanding of what will make the contact between two materials effective or not, allowing for interactions of variable intensity. It also comes with a variety of scientific tools for characterizing the quality of the substrate, the properties of the new material layer and their interface. In the case of concrete surface treatment, this is especially important for achieving lasting results. Benoît Bissonnette is professor of civil engineering at Laval University in Quebec City, Canada. Luc Courard is professor of building materials at the University of Liège in Belgium. Andrzej Garbacz is professor of building materials engineering in the Department of Building Materials Engineering at the Warsaw University of Technology in Poland. Benoît Bissonnette, FACI, is professor of civil engineering at Laval University in Quebec City, Canada. He has co-managed the NSERC Industrial Research Chair on Durable Repair and Optimized Maintenance of Concrete Infrastructure in the recent years and has been involved in a wide variety of research projects devoted to concrete repair. Dr. Bissonnette is a member of several technical committees of the American Concrete Institute (ACI C223 Shrinkage-compensating concrete; ACI C364 Rehabilitation), the International Union of Laboratories and Experts in Construction Materials, Systems and Structures (RILEM TC 181-EAS, TC 193-RLS), and the International Concrete Repair Institute (ICRI Repair Materials and Methods Committee. He has authored or coauthored more than 125 peer-reviewed papers. Luc Courard is professor of building materials at the University of Liège in Belgium. After completing his PhD work on concrete surface characterization in the late 1990s, he went to Laval University for postdoctoral research. His research activities are still dedicated to concrete surface characterization, as well as to innovative repair materials and supplementary cementitious materials. Dr. Courard is a member of the American Concrete Institute, the International Union of Laboratories and Experts in Construction Materials, Systems and Structures and the Belgian Group of Concrete. He has authored or coauthored more than 140 peer-reviewed papers. Andrzej Garbacz is professor of building materials engineering in the Department of Building Materials Engineering at the Warsaw University of Technology, Poland. Dr. Garbacz’s research interests include concrete-polymer composites, repair materials, microstructure characterization, non-destructive testing (NDT) techniques for concrete characterization and evaluation of repair materials. In 2005, he became a senior member of the International Union of Laboratories and Experts in Construction Materials, Systems and Structures (RILEM). He has been participating actively to the International Congress on Polymers in Concrete (ICPIC) since 1992, being appointed as a member of the board of directors in 2007 and as secretary in 2013. He has authored or coauthored more than 120 peer-reviewed papers. "The book is well written and thorough. It covers the pertinent topics related to concrete surfaces very thoroughly, in a logical order, and with very good documentation of the presented information. … I believe that this book will be the standard on concrete surfaces for years to come." 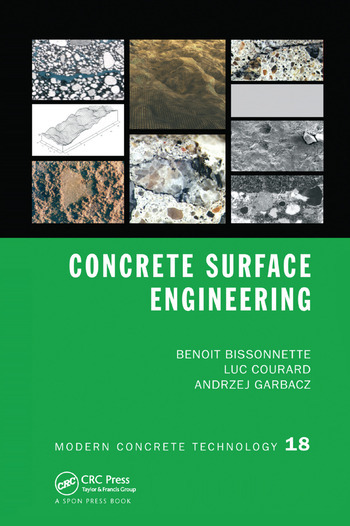 "This book provides a thorough survey of the various aspects of the concrete surface, aspects that are relevant for the success of the repair." "The book's emphasis is on the repair of concrete and the understanding and preparation of materials to enable effective repairs. It considers the fundamentals of adhesion and the principles of surface engineering, and reviews practical techniques for the assessment and preparation of surfaces."